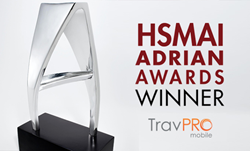 TravPRO Mobile, a global leader in the B2B sales training and mobile enablement space, announced today it is again a big winner in the 2018 HSMAI Adrian Awards competition. This marks the third year in a row that TravPRO has been recognized with multiple wins in the global competition. “This is significant for us. It shows we consistently produce award winning, world-class programs and again honored to yet again be recognized for the innovation it is delivering to the sales training and mobile enablement space,” said founder and CEO Jonathan Cooper. TravPRO received a Silver award for their work with Globus Family of Brands, and a Bronze award for work on the Los Angeles Insider program. This year more than 1,100 entries were submitted in hospitality, travel, tourism and media. Judges were asked to evaluate each entry based on its own merit and success in achieving its objectives. About TravPro Mobile: TravPro Mobile, a three-time Adrian Award winner, has been redefining global B2B2C training and sales enablement space. Their Sales Companion™ enables a greater number of sales reps to easily train, retain, promote and convert more bookings vs. just a few super stars. To find out more visit http://www.travpromobile.com.